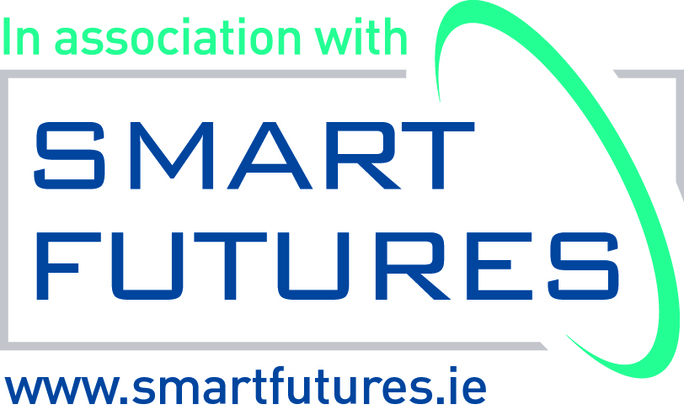 The Boole Zone coincided with Engineers Week in Ireland and it is the third I’m an Engineer zone to involve Irish schools and engineers. In total 377 students from 11 schools registered to take part, making this the largest I’m an Engineer zone in the country so far. 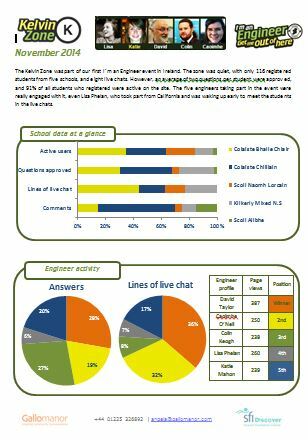 Overall, there was a high level of engagement from the engineers and the top four answered a similar amount of questions in ASK. Padraic, the zone winner, attended every available CHAT and typed the most lines on average during them (60). It was notable that every engineer attended CHATS after they were evicted. 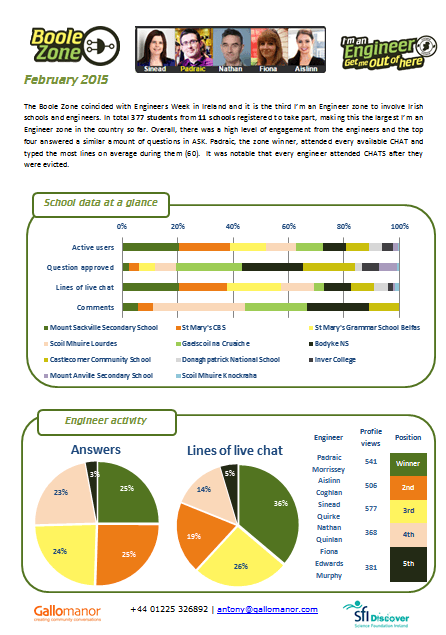 The Energy Zone had a very high percentage of active students, up to 91% of the registered students chatted, asked a question, commented or voted in the site. 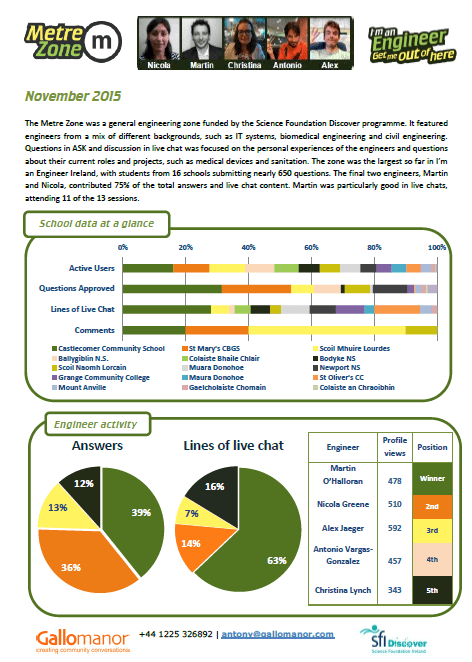 Laura Tobin, the zone winner, attended to every live chat and was therefore responsible of more than half of the scientists’ lines of live chat. 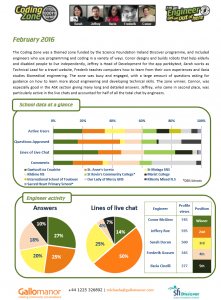 The number of answers to ASK questions, on the other hand, was well distributed among the five engineers who took part in this zone. The Kelvin Zone was part of our first I’m an Engineer event in Ireland and it was the first General Engineering Zone we’ve ever done. 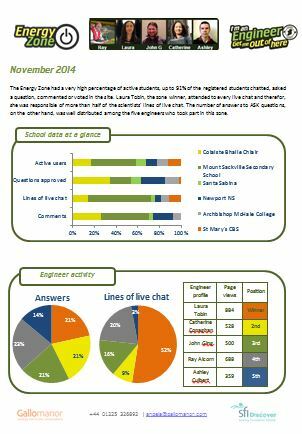 An average of two questions per student were approved and sent to the engineers, and 91% of all students who registered were active on the site, in spite of being a quiet zone with only 116 registered students. The five engineers taking part in the event engaged really well, even Lisa Phelan, who took part from California and was waking up early to meet the students in the live chats.